Our Annual Spring Retreat Has a New Home! Once again we will have the opportunity to continue our tradition of a relaxing weekend away—at Circle Lodge, the Workmen’s Circle-owned and operated camp! Check out our Annual Retreat Photo Album. Note that the dates for our 2018 Annual Retreat have not yet been set. Our weekend retreats have traditionally been one of our community’s most popular events. They are purely social family outings and help us build a real community. 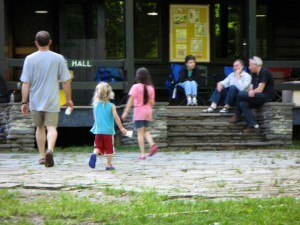 We are fortunate to have at our disposal Circle Lodge, the Workmen’s Circle-owned and operated camp located near Poughkeepsie, NY (known as Camp Kinder Ring in the summer). Activities remain largely informal and unscheduled—a weekend when we can "schmooze" with old and new friends and relax. 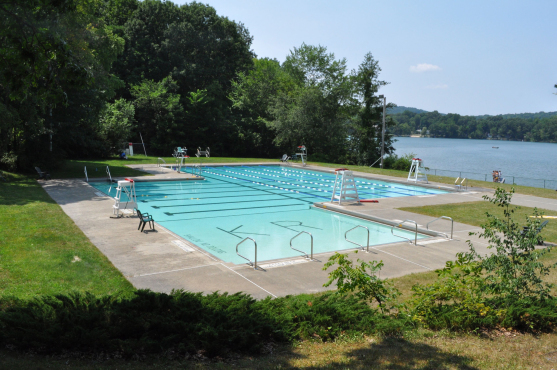 The camp is equipped with an Olympic sized heated pool (swimming hours: Saturday 2:30 – 5:30), lit tennis courts, indoor and outdoor lit basketball courts, beach and standard volleyball courts, a gaga court, table tennis, softball fields, soccer/football fields, an indoor gym and yoga studio, a state-of-the-art movie theater, a running track, and even an outdoor hockey rink. Outdoor picnics and barbeques, hiking, and campfires are permitted. And remember, guests of members are always welcome! What’s the Same at Circle Lodge? For those of you accustomed to our Stokes retreats, the Circle Lodge schedule is the same: we arrive Friday afternoon (5:00 pm or later) and leave Sunday after lunch. The weekend includes bunk housing for 2 nights, and 5 meals. What’s Different about Circle Lodge? Most significantly, we would not be responsible for preparing our meals or cleaning the camp, as we have been in the past. While meal preparation (and camp cleaning?) provided for social interaction, these responsibilities occupied virtually the entire weekend for the half dozen or so retreat organizers. Because Circle Lodge has staff on site to attend to these duties, costs are higher, even though the Workmen’s Circle has reduced the standard rates to get this to work for our community. Due to the already-reduced rate structure, special Saturday-Only rates are no longer available. Also, while some available activities are similar to those we engaged in at Stokes (gaga court, hiking, soccer/football fields, campfires), there are many more activities available at Circle Lodge: see About the Weekend above. 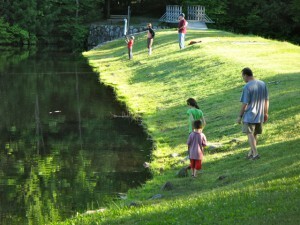 Accommodations at Circle Lodge are less rustic than those at Stokes, and no tent camping is permitted at Circle Lodge. Finally, the camp is about 2 hours away, about 30 minutes longer than it takes to get to Stokes. Holding our retreats at Circle Lodge will also give us an opportunity to book our weekend at the same time as other Workmen's Circle-affiliated organizations. Meals. 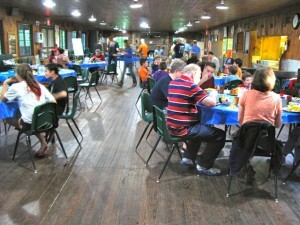 Food for meals (Saturday breakfast through Sunday lunch), as well as food service and cleanup for all meals, is provided by camp staff. Please list any dietary restrictions on your Registration Form. Circle Lodge has a liquor license and will provide the wine and beer of our choosing. Guests are not permitted to bring their own food or alcohol. Meal and snack times for our visit are: Saturday breakfast, 8:00 - 9:00; Saturday lunch, 12:00 - 1:00, Saturday snack at the pool, Saturday dinner, 6:30 - 8:30; Saturday night s’mores at campfire, 9:00 - 10:00; Sunday breakfast, 9:00 – 10:00; Sunday lunch, 1:00 - 2:00. Remember, food is NOT included for Friday dinner; we recommend that you eat prior to your arrival at the camp on Friday. Sleeping. Circle Lodge has bunk housing that accommodates 8-15 people per bunk, and each bunk has sinks and toilets. Many of the bunks have showers as well. Bathhouses with showers are a short walk from bunks. Families are welcome to stay together. Food is NOT allowed in the bunks. What to Bring. Be sure to bring flashlights, sleeping bags and/or sheets and blankets, pillows, towels, soap, and any other personal items you might require. The camp can store any medicines that require refrigeration. Sports equipment is kept on site for the use of guests, and is available for 30 minutes after breakfast and lunch on Saturday, and after breakfast on Sunday. Equipment borrowed from the camp should be returned after use. You are also encouraged to bring anything you might desire: musical instruments, board games and outdoor games, recreational reading, athletic equipment, etc. Board games (some available on site) are an especially good idea for the evenings or in the event of foul weather. Pets are not permitted. Your Contribution. No food preparation or facility cleaning is required. Just as we would when visiting any community spaces, trash should be deposited in appropriate receptacles and not on camp grounds. The camp’s sports equipment and games should be returned to their designated locations after use. Children should be supervised at all times. For additional information on our Annual Retreat, please Contact Us.